Type or paste the name or HTML code of any web color, and see it fill your entire screen, in real-time, while you type. 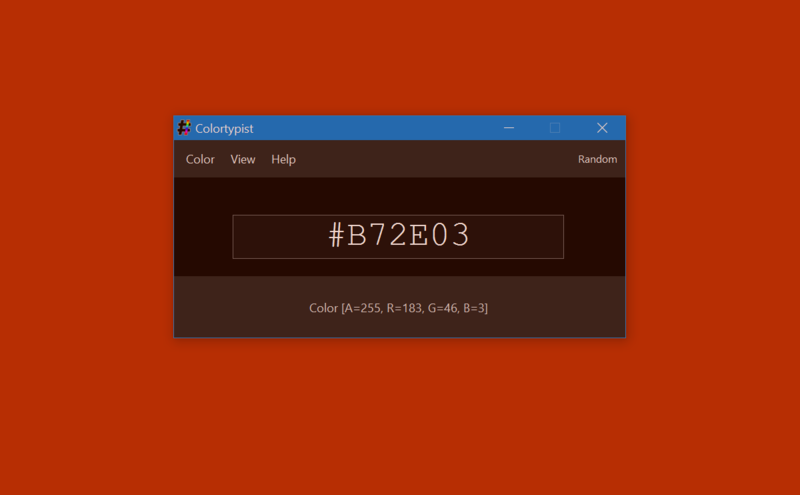 Enter color names, HTML codes, RGB triplets or integer values. And easily convert between any of these formats. Easily set your favorite tint as your Desktop Wallpaper. You may get a more modern looking Desktop, and a faster PC. Copy and reuse html colors in external apps, for various purposes. Such as generating web color schemes, or palettes. Generate and save images of any size, filled with the color of your choice. For anonymous profile images, or backgrounds. Save any color in a tiny HTML file. Then open the file and view the color in any browser, on any PC, tablet or smartphone. Paste colors into Colortypist. From any external site or app, such as a web color picker, or a HTML color wheel. Colortypist has a clean and easy to use interface. Type colors in the large edit box, and use the menus for the main functions. Learn web color names by trial and error. Or have fun by typing weird color names, or words that are also color codes. Colortypist is a smart graphic design addon, well worth its 40KB download. Go grab a copy now. Colortypist, Realtime Desktop Wallpaper Color Selector: a better way of experimenting with background colors. It's clear that this program was not only made for graphic designers, but by them, as well. It's stylish, smooth, and does exactly what you need it to in a matter of seconds. It's even portable so you can have it with you on a thumb drive and use it on any computer. If you do any work with colors or HTML, Colortypist is a phenomenal download to have.